Looking for a tour? We offer co-ed and women only tours to Bhutan. 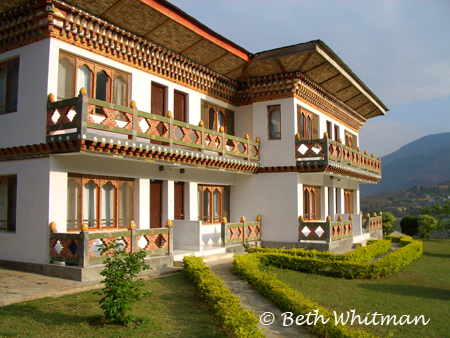 Taking a Bhutan holiday or vacation? Here are interesting facts and tips for traveling to the Kingdom of Bhutan. The entire country is 6 hours ahead of GMT. More practically, for you North Americans, it’s 10 hours ahead of EST. The national language is Dzongkha, though many people speak English and school lessons are often taught in English. Various dialects are spoken throughout the country and these often include words from nearby countries, such as Tibet, Nepal and India. 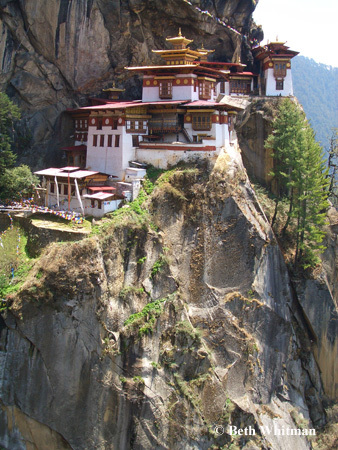 At one time, the government had imposed a limit to the number of visitors who could enter Bhutan. That is no longer the case (though many people still believe this to be true). The fact is that the government imposes a high daily tariff on all travelers. This is the minimum that a person will pay per day to travel in Bhutan. Currently, this is $200/day but is scheduled to be increased to $250/day in 2012. Travelers must join an organized tour in order to enter the country and you must be accompanied by a guide and driver throughout your time there. You can go as an individual or twosome, but you will pay a higher daily tariff (closer to $250/day). 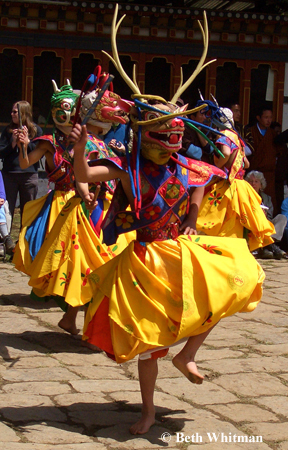 Learn about the upcoming Bhutan tours including the co-ed Laya Bhutan Trek. To begin with, the country does not have the infrastructure to accommodate hoards of travelers. 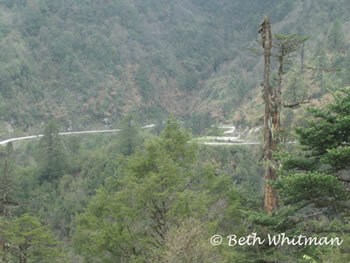 There is one main road that traverses west from Paro (where the one international airport is located) to the east. Along the way, there are few towns and villages where one can stop to overnight. With few hotels and fewer restaurants (most meals are eaten at the hotels), you can see why it’s in Bhutan’s interest in keeping the number of tourists down. This is probably a good thing because the country is also trying desperately to hold on to their culture, religion and traditional way of life. Festivals (tsechus) are regularly held throughout the country and are a way for communities to come together and celebrate harvest time and other special events. For now, locals outnumber tourists at the tsechus – I hope it stays that way! You must have a visa in order to enter Bhutan. Actually, you need a visa in order to board your flight TO Bhutan. The person checking you in for your flight will ask for this information. If you are going to Bhutan on an organized tour, your tour leader will have this information. If you’ve booked a private tour through a tour agent in Bhutan, you will have been emailed your visa. The cost is $20 and is usually included in the cost of your tour. The currency in Bhutan is the ngultrum and is on par with the Indian rupee. There are few banks in Bhutan so you would do well to carry U.S. dollars and get at least some of this exchanged immediately upon arrival at the airport. $50 and $100 bills will get you a better exchange rate than a $20 bill or smaller. You’ll also be charged a small exchange fee if you are changing travelers checks. At this time, there are no ATM’s in Bhutan that will accept foreign cards. 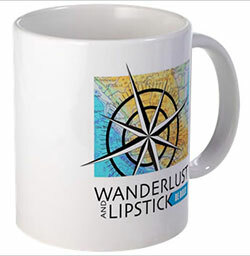 Few gift shops accept travelers checks and even fewer will accept credit cards. When a shop does accept a credit card, there is usually a 7% surcharge added to the price. It’s possible to spend Indian rupees in Bhutan but the government has banned the use of anything over 500 rupee notes due to rampant counterfeiting. Meals in Bhutan tend to be basic but super fresh. 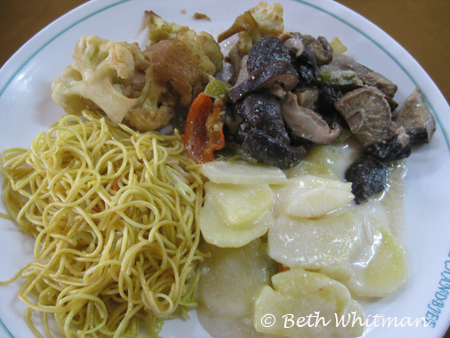 Lunch and dinners consist of freshly cooked vegetables (fiddlehead ferns, potatoes, cauliflower, mushrooms) a meat dish and either Bhutanese red rice or white rice. Sometimes a meal will be influenced by the cuisine of India, Tibet or Nepal and may incorporate bread, spices and traditional dishes from these countries. Chilli and cheese (ema datse) is considered the national dish of Bhutan and is served as a side dish. If you like spicy food, ask for the chilli and cheese that your guide and driver are eating. What’s served to tourists is way toned down. Hotels are already required by the government to meet certain standards but in 2012 they will have to comply with international 3-star standards. Currently hotels are frantically upgrading with extra amenities (including wifi) so that they can be certified by the government. This must be done by 2012, when the tariff is raised. Hotel rooms are generally very comfortable. They are heated either by a wood burning stove or electric heat. Western-style toilets are the norm and many hotels offer cable TV and phones in the room. Some hotels offer computers with Internet access in their lobby area while some hotels already have wifi available throughout the hotel. There’s a wide range of weather in Bhutan. The south is tropical, the central area is more temperate and the north, closer to the Himalayas, is cold. On any given day in the central area, where the one main road traverses, you can go from freezing in the morning to the mid-70’s by mid-afternoon. The spring and fall have the best travel weather because winters tend to be cold and summers wet. Depending on the size of your group, you may travel in a small car, mini-van or small bus that can accommodate about 17 people. These are generally all quite comfortable but you’ll be traveling on roads that twist and turn almost constantly. Many people get car sick the first day but adapt to the roads rather quickly. If you’re prone to motion sickness, you’ll want to carry some Dramamine, ginger or accu-pressure wrist bands. Motorcycles can also be found in Bhutan though you have to make arrangements well in advance if you plan on renting one. If you’re keen on it, you can join an organized motorcycle tour. Most good bikes are rented from India. There are public buses in Bhutan but they are only used by the locals. Druk Air is the government-owned airline that serves as the primary carrier into Bhutan. They fly from Bangkok, Delhi, Kolkatta, Dakar (Bangladesh), Kathmandu and Bagdora (India). Flights are limited and sometimes it’s difficult to get seats during big festival times. Your tour operator will be the one booking your tickets so don’t attempt to book your own. 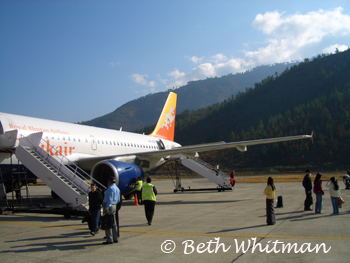 More recently, Buddha Air (yes, Buddha Air) has begun limited service from Kathmandu to Paro. There are a number of handicrafts that are produced in Bhutan. This includes paper, carvings, paintings, thangkas and weavings. Many souvenirs in Bhutan are actually imported from India or Nepal. In the case of jewelry, sometimes the beads will be imported and the jewelry assembled in Bhutan, or so the shopkeeper will tell you. Because so much is imported, it tends to be quite expensive, so you’ll pay far more than you would if you purchased in the country of origin. If you’re not concerned about the item’s origin, there are many things that will make for lovely souvenirs including scarves, jewelry, and items used in Buddhist rituals such as bells, mala beads and prayer bowls. Weavings and thangkas are usually created in Bhutan and are often quite expensive. A well-made table cloth or kira (dress for women) can cost upwards of $1000 U.S. If purchased at the government emporium or the Textile Museum, you can use a credit card. But smaller shops and locals selling their own wares likely won’t be able to accept anything but cash – and at these prices, you’re better off using U.S. dollars rather than trying to count out the ngultrum! Tsechus (or festivals) are religious events in Bhutan. They usually occur over several days and happen throughout the country, with the more popular/well-attended ones in the spring and fall. Locals get dressed in their finest traditional clothing and attend with the entire family. Many times the dancing goes on until the very wee hours of the morning or start well before sunrise. Elaborate costumes are worn by the performers and dancers and singers are quite skilled in their art. The dates of the festivals change based on the full moon and sometimes the dates can change because the town isn’t prepared. While it’s unlikely that the larger tsechu’s (in Paro, Thimphu and Bumthang) would have a date change at the last minute, don’t be too disappointed if this happens at one of the smaller festivals. Some people have reported that they’ve been treated better by the locals if they wear traditional clothing though I’ve never felt snubbed by NOT wearing a kira. Photography is allowed though always be gracious and respectful. It’s unlikely that you’ll need to haul around your luggage yourself as the staff at hotels are always very helpful and your guide and/or driver will help as well. Even so, it’s best to pack as light as possible. No matter what part of Bhutan you are going to, it’s likely that you will encounter a variety of weather conditions and the best thing to do is to dress in layers. Hiking shoes are not necessary for everyone and not required on all hikes, though if you are in need of ankle support, consider bringing a broken-in pair. Keen or Teva sandals will work well (especially if they have good traction on the bottom) and these come in waterproof versions – perfect for unpredictable weather and muddy conditions. A light windbreaker or rain jacket will come in handy as well as a pair of jeans and a pair of capris (great for the warmer days). 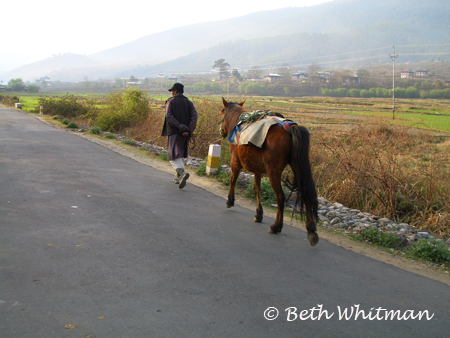 The Bhutanese are relatively conservative in their dress and even on the warmest of days, it’s probably best to avoid tank tops and shorts. Sunglasses and sunscreen are important due to the strength of the sun at that altitude. 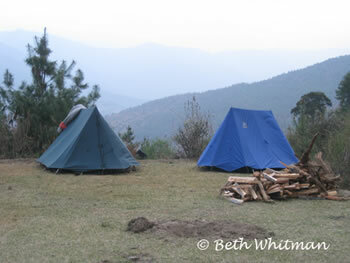 Bhutan provides a tremendous range of treks, from the 28-day Snowman Trek to overnight trips. Bhutan: A Trekker’s Journey, is probably the best resource for choosing a trek but many tour companies offer special treks that might not be listed in this great resource. Yaks and ponies are used to carry bags, tents, sleeping bags, food and water. Most trekking days consist of about 5 hours on the trail. While the treks are not always difficult, you’ll be at altitude, making it that much more harder when you’re not used to the elevation. While a permit is required, your tour operator will have made arrangements for yours. Cigarettes are officially illegal in Bhutan but more and more you’ll see locals smoking in public (gasp!). It’s usually done somewhat discreetly, but it is done and I haven’t seen anyone arrested yet. You can import a “reasonable” amount for consumption but will be charged an import tax for doing so. It’s recommended that you don’t drink the tap water and avoid using it for brushing your teeth. Bottled water is available everywhere. You should be drinking plenty of this because of the altitude. Bhutan power plugs use the same sort of configuration that you’ll find in India. Any multi-country adaptor kit that you purchase will come with a plug for Bhutan. I have found that some power plugs actually will accept my power plugs from the U.S. If you have electronics that have been manufactured anytime recently, they will have an internal power converter so you do not need to carry a converter for your laptop, video camera, etc. You’ll just need the right power adaptor so it will fit into the power outlet. Bhutan is in the middle of a big change. More hotels are installing Wifi and a few internet cafes have cropped up (namely in Thimphu and Bumthang). Some hotels have computers for use but often they will have a virus or are dial up – making them painfully slow. Be sure to let your family know that they might not hear from you for days at a time as a result. Cell phone towers are few and far between in this country with one road. The major towns (Paro, Thimphu and Bumthang) have reasonable service but don’t expect much more than that. Even when you can get service, the lines are often too busy to accept your call. Texting seems to work OK. Check with your provider for the cost of a call using your phone while in Bhutan. ATT is about $5/minute. FIVE DOLLARS A MINUTE! I bring an old (unlocked) phone with me, buy a SIM card when I arrive and load it up with minutes in case I need it. It’s still about .50 cents/minute but it beats the FIVE DOLLARS A MINUTE from ATT.